Add the buckwheat to a food processor and blend until it has a flour-like consistency. Add the remaining ingredients and blend again until everything is well combined and it's starting to stick together. If it's not sticking together, add a little water (I added 2 tbsp) and blend again. Align a baking tray (20 x 20 cm) with parchment paper and press the mixture into it. Make an even layer. Place it in the freezer for at least an hour to set. In the meantime, peel and cut the sweet potatoes into small pieces. Boil them in water for 8-10 minutes or until soft. Allow the sweet potato to cool for a few minutes. In a food processor, add the slightly cooled sweet potato, cacao powder, peanut butter, maple syrup and salt. Blend until everything is mixed well together and the consistency is smooth. Taste and adjust to your preference - more maple syrup for sweetness, cacao powder for chocolate flavour, peanut butter for creaminess, salt to enhance the flavours. 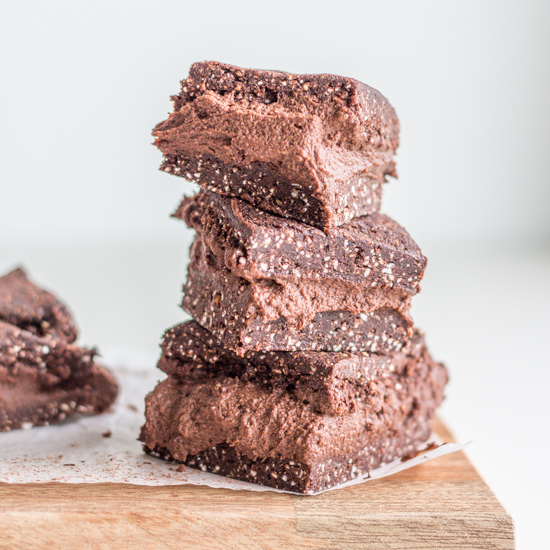 Take the brownie out of the freezer and cut it into two equal size pieces. Spread the sweet potato filling on one part and place the other part on top to make a sandwich. Place it in the fridge for at least an hour to set before cutting it into six pieces. 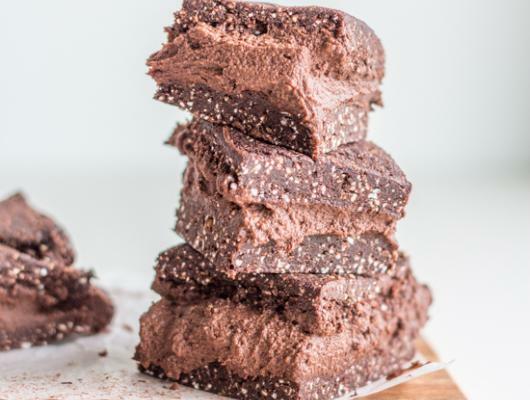 These vegan buckwheat brownie sandwiches are rich, sweet, somewhat healthy, addicting, and insanely delicious. Vegan and gluten free!